Our aluminum sand foundry pours many of the 300 series aluminum alloys. These include the 355, 356, and A356 aluminum alloys which are excellent for pressure type applications such as air flow pipes and elbows, liquid flow pipes and elbows, housings and gearboxes. 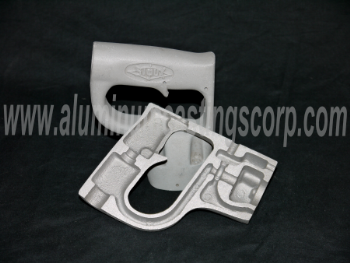 The high fluidity of these aluminum alloys also lends themselves to thin wall aluminum castings. Depending on the size and casting design wall thicknesses down to 0.156" can be sand cast using the 300 series aluminum alloys. 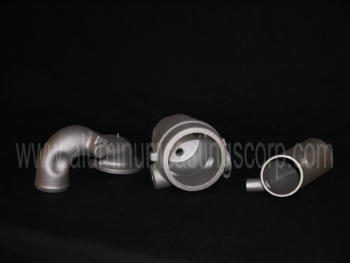 Aluminum alloy 356 has excellent casting characteristics and corrosion resistance along with good machinability and weldability. Common products manufactured from sand cast aluminum alloy 356 in our aluminum foundry include transmission cases, flywheel housings, oil pans, brackets along with various fittings and pump bodies.